Science fiction is a genre that encourages the reader to briefly suspend reality. Most of the elements of the genre (futurism, advanced technology and scientific progress) are utilized to create dystopian or alternate realities that differ from our world...or do they? Actually, science fiction offers a social criticism of our modern society, suggesting that the problems we face now may produce something far worse if we fail to confront them in the present. 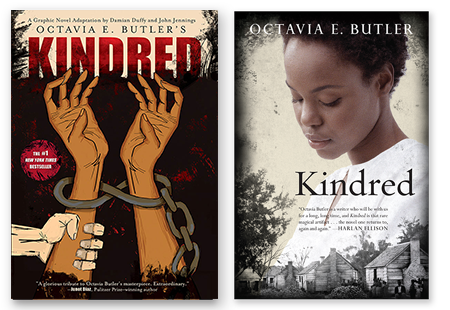 Kindred is one such example, as the novel's protagonist, Dana, finds herself continuously pulled back in time to the Antebellum South. In 1818, Dana is no longer free, treated instead as a slave on the plantation of someone who will come to be her great, great grandfather. In fact, Dana's returns to the past are triggered by moments in which her ancestor, Rufus, finds himself in trouble, requiring Dana's help. Dana is forced to save Rufus on multiple occasions, worried that if she fails to do so, she may cease to exist. However, this brings its own complications, especially when Rufus starts to act the part of the aggressive, racist white plantation master. Octavia Butler is essentially asking the reader to consider if this kind of racism is truly gone, even a hundred years later in Dana's present time of 1976. The novel is clearly highlighting the oppression of African Americans and the inequalities that still persevere in a white-dominated society. However, at the same time, the novel is also asking us to consider the experiences of a black woman in this kind of society. For Dana, there are actually two oppressive forces at work: that of being black and that of being a woman. In effect, this novel demonstrates the ways in which both race and gender work together, especially in regard to black women. Dana's character provides a vehicle in which we, as readers, can try to understand this experience. But, as the novel also shows us, it is impossible to really understand because we can't truly comprehend the situation unless we experience it for ourselves. Dana doesn't truly understand the complexities of slavery until she goes back in time and becomes a slave herself, enduring the abuse and violence of a society that subjugated African Americans. Thus, the reader likewise is incapable of grasping this experience, but it is important that we try to confront it. Otherwise, the problems we face in society will only worsen over time. Casey is a current Senior at the University of North Carolina at Chapel Hill. She is double majoring in English and History and minoring in Global Film studies. Casey enjoys reading fantasy fiction, listening to music, and writing her own creative fiction.